Designers Abroad, Michele Keith's follow-up to her highly successful book Designers Here and There, features twenty-two vacation homes of today's top interior designers, exquisitely captured in over 200 lush color photographs. For some, vacation homes offer an opportunity to escape from the office, to shut off, to wind down. For decorators, however, vacation homes mean just the opposite—they provide the opportunity to bring work home as they roam the globe, honing their design sensibilities and expanding collections of treasures. Designers Abroad takes the reader on a tour of the world, from Sri Lanka to South Africa to Sweden, by peeking into the gorgeously appointed homes of renowned interior designers. In lively and dynamic text, Michele Keith explores how they incorporate the distinct and native character a foreign land into their second homes, all the while expressing personal style. Embracing new cultures’ climates, architectural traditions, and indigenous art, fabrics, and furniture, each designer creates a space at once comfortable and glamorous, a place of solace and inspiration. Designers Abroad, Michele Keith's follow-up to her highly successful book Designers Here and There, features twenty-two vacation homes of today's top interior designers, exquisitely captured in over 200 lush color photographs. For some, vacation homes offer an opportunity to escape from the office, to shut off, to wind down. For decorators, however, vacation homes mean just the opposite—they provide the opportunity to bring work home as they roam the globe, honing their design sensibilities and expanding collections of treasures. Designers Abroad takes the reader on a tour of the world, from Sri Lanka to South Africa to Sweden, by peeking into the gorgeously appointed homes of renowned interior designers. In lively and dynamic text, Michele Keith explores how they incorporate the distinct and native character a foreign land into their second homes, all the while expressing personal style. Embracing new cultures’ climates, architectural traditions, and indigenous art, fabrics, and furniture, each designer creates a space at once comfortable and glamorous, a place of solace and inspiration. 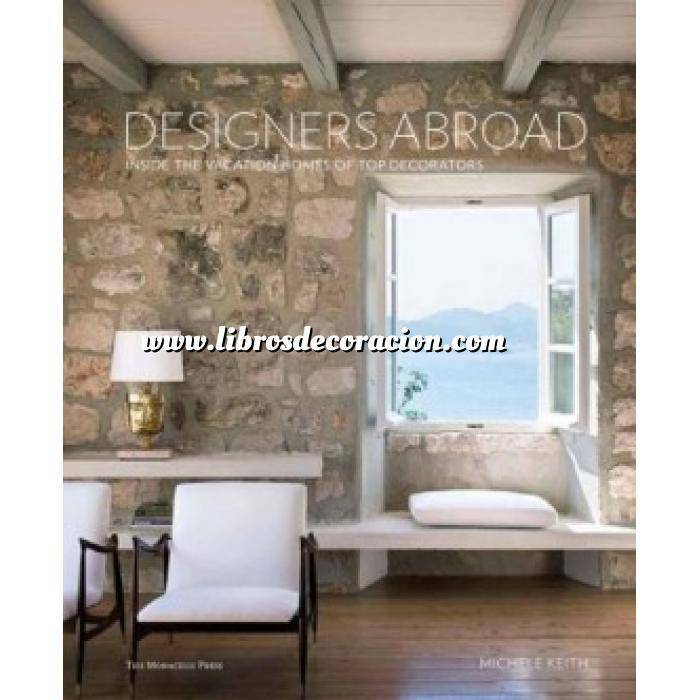 Designers Abroad offers inside peeks into residences ranging from a chic studio in Paris to a house perched on windswept cliffs in Nova Scotia, from a beachside abode nestled among boulders in Cabo San Lucas, Mexico, to a former monastery outside Rome dating back to the fifteenth century. Each project is accompanied by the story of how its design was conceived and executed, and how the attributes of each country inspired its owners—including Lars Bolander, Alessandra Branca, Clodagh, Timothy Corrigan, Mica Ertegun, Fisher Weisman, Juan Pablo Molyneux, Juan Montoya, and Cortney and Robert Novogratz, among others. Designers Abroad demonstrates how these designers incorporate their passion for travel into their own interiors, and thus inspires readers to add a touch of the exotic to their own homes. "Creating a solid library should be a pleasure and a prerequisite for any design addict. First we gathered our top picks of recent and forthcoming releases. Of particular note . . . The Monacelli Press's Designers Here and There visits the addresses of decorating greats." "Michele Keith indulges our voyeuristic desires with this tour through 38 primary and vacation residences owned by the country's hottest decorators." "The homes of 19 designers provide endless inspiration—and evidence of experimentation—in these vivid photo essays. Be sure not to miss top tips from each pro." "Ms. Keith documents the wide array of spaces designers create for themselves . . . Read and be inspired, or jealous. Or both." "Michele Keith does what most of us long to do: She takes a long, extended glance into the domestic domains of some of America's most talented interior designers, to see how they deck their own halls. Pick up a copy and see from where inspriation springs." "Style-minded pros open their primary and secondary residences for your viewing pleasure in Michele Keith's fascinating Designers Here and There: Inside the City and Country Homes of America's Top Decorators. What a treat it is to compare and contrast two dwellings inhabited by each designer revealing different aspects of the same creative spirit." "This is a beautiful book. If you're interested in interior desgin as much as I am and you like to collect coffee table books, or you're looking for a gift for a friend who fits that profile, I would definitely suggest picking up a copy!" "Find yourself inspired by . . . Designers Here and There." "From Designers Here and There: Inside the City and Country Homes of America's Top Decorators, it is evident that these designers have a passion for life and it shows in the spaces they carve out for themselves and their loved ones." "Michele Keith is on to something. San Francisco's interior designers work like no others because they're surrounded by beauty: the bay, the ocean, the headlands, the city's landscape and unique topography . . . Unusual for an interior design coffee table book that surveys a wide field, Keith begins with San Francisco and wends her way back to New York City and environs via places like Santa Fe, N.M., Dallas, Houston and Chicago." "[Designers Here and There] gives you a glimpse into the tastes and likes of the decorators themselves—their own personal style. It’s also a fabulous resource because it covers a range of different design styles—every time I pick up the book I notice something new." "Take a sneak peak into designers' private homes, including the pads of L.A.'s Michael Berman, Molly Luetkemeyer and Barclay Butera." "If reading interior-design coffee-table books is a crime, we plead guilty. But can you blame us? We just couldn't put down Designers Here and There: Inside the City and Country Homes of America's Top Decorators . . . Another favorite feature of this book: two pages of design tips from the profiled designers." "More than just pretty pictures . . . so brimming with information and tips that you'll come down with a case of cabin fever!" "There is nothing more fascinating than getting a peek into the homes of others. When this group of top designers allowed Michele Keith to open the door not only to their urban dwellings but also to their second homes, we were given an opportunity for aspirational voyeurism that is unique. Grab the book, cast yourself on a sofa and go on one of the most revealing designer tours of all, the designers’ own homes." "Michele Keith provides great insight into the lives and personalities of some of our most celebrated designers through beautiful photographs of their homes. This book is for everyone who would like to discover how those who design for others design for themselves." "Up close and personal views of some of my favorite interior designers—plus their favorite decorating tips—make this book a must-read."